Killed instantly at Petersburg, on Friday morning December 2, 1864, Brigadier General ARCHIBALD GRACIE. His funeral will take place this (Monday) morning, the 5th instant, at 11 o’clock, from St. James church. Department of Richmond, December 3, 1864. 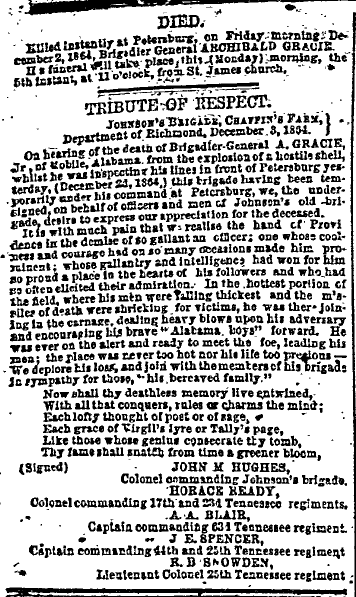 On hearing of the death of Brigadier-General A. GRACIE, Jr. of Mobile, Alabama from the explosion of a hostile shell, whilst he was inspecting his lines in front of Petersburg yesterday, (December 2d, 1864,) this brigade having been temporarily under his command at Petersburg, we, the undersigned, on behalf of officers and men of Johnson’s old brigade, desire to express our appreciation for the deceased. Colonel commanding 17th and 23rd Tennessee regimnets. Captain commanding 63d Tennessee regiment. Captain commanding 44th and 25th Tennessee regiment.